The first over-the-water bungalows in the Caribbean! | UNIGLOBE Direct Travel Ltd. 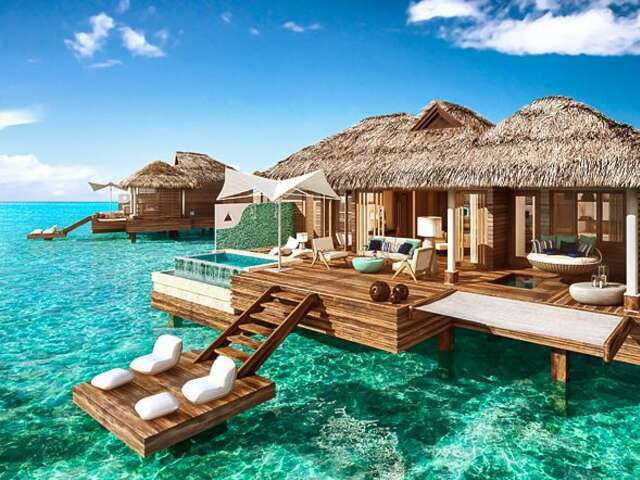 Introducing the spectacular 12 new Over-The-Water Bungalows at Sandals Royal Caribbean. Reminiscent of a Tahiti–style bungalow, these gorgeous villas must be seen to be believed - watch the video! Introducing the spectacular 12 new Over-The-Water Bungalows at Sandals Royal Caribbean in Jamaica. 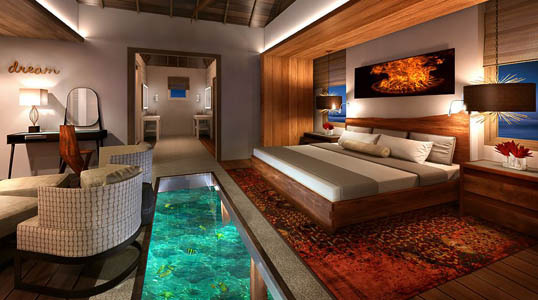 These gorgeous over-the-water suites feature glass floor panels and lit water, so you can enjoy undersea views any time. Plus, each bungalow boasts a private outdoor Tranquility Soaking Tub, overwater hammocks, extended sun deck, and outdoor shower. The bathrooms are equipped with a large backlit mirror, his and hers sinks, and a walk-in rain shower. Bungalow guests also enjoy Sandals Butler Elite service, 24-hour room service, and a private water taxi to take you to and from the mainland. Reminiscent of a Tahiti–style bungalow, these gorgeous Over-the-Water Villas convey an intimate connection to the Caribbean Sea. From floating water hammocks to glass floors—your villa delivers an immersive journey of the Caribbean's finest turquoise waters and rich marine life. Plus, guests can enjoy private boat transfers to and from the resort – all included. Couples can admire the majestic beauty of the ocean from their private infinity pool and Jacuzzi with outdoor shower. Contact us today to find out more about these amazing over-the-water bungalows - perfect for your honeymoon if you're looking for that special romantic getaway!